Erin Stiebel isn’t from here, but you’d never know it by looking at her calendar. Her weekdays are booked solid with coffee and lunch dates. Her evenings are filled with board and committee meetings, social events and impromptu visitors. 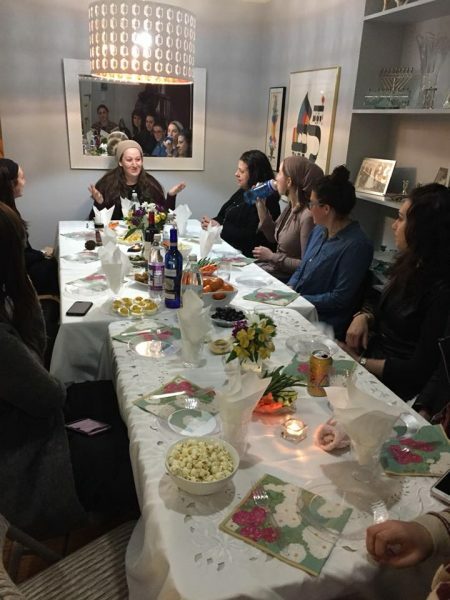 Every Friday night, her Shabbat table is full. So how’d she get to be so popular in her non-native Detroit? She might credit her work as an Educator in the young adult division of Partners Detroit, or her involvement with NEXTGen Detroit, or one of the many other organizations and initiatives she’s a part of here in the community. But, if you know Erin, then you know it has far more to do with her contagious personality and commitment to community than it has to do with any official business. And if you don’t know her (yet), read on. All things will be revealed. “The majority of my day is spent investing in people. Every week I meet with between 8 to 14 young adults. It could be sitting down with someone to discuss his or her dating life. It could be talking about Jewish customs surrounding death and mourning with a young adult who recently lost a parent. It could be making a shiva call, dropping off dinner for someone who just had a baby, visiting someone who is sick or helping someone find the right trip to Israel. It could be anything, but it’s about showing up when someone needs you and giving unconditional investment and interest,” said Erin. Erin began working at Partners Detroit in 2014, two years after moving to the area. She describes Partners as the place where Detroit comes to learn. 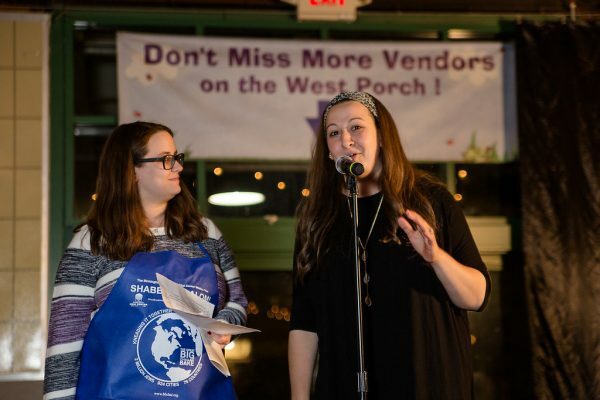 The organization works with people looking to bring Judaism into their lives on a deeper level and provide them with the resources, trips, conversations, friendships and connections to do just that. 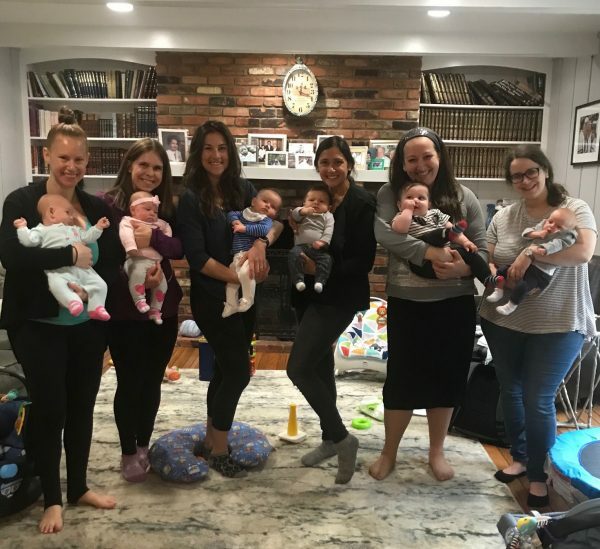 Over the years, Erin has given classes on Judaism and pregnancy for first-time expectant moms, now offering a follow-up Mommy and Me Lunch Bunch class once a week that looks at Jewish pearls of wisdom on parenting. She’s done challah bakes and “Shabbat in an Hour” cooking classes. She’s given lectures on davening and prayer and preparing for the High Holidays. She’s taught about giving charity and the ins and outs of tzedakah. That’s just to name but a few. Erin’s Mommy and Me Lunch Bunch class. Leading a “brachos party” at the home of a young professional. 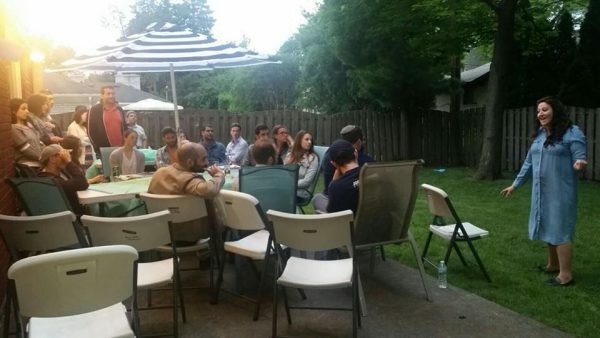 Friday nights have become Erin’s favorite part of the week since she started hosting Shabbat meals for Partners Detroit young adults. Some weeks she and her husband, David, have two people, and some weeks they have 22, but every week is special, not only for the guests, but also for the Stiebels. Erin with husband David and their boys: Alexander (4.5-years-old), Solly (2.5-years-old) and Louie (10 months). Pulling out all the stops once a week is a lot of work. But Erin has a system and more importantly, she loves it. 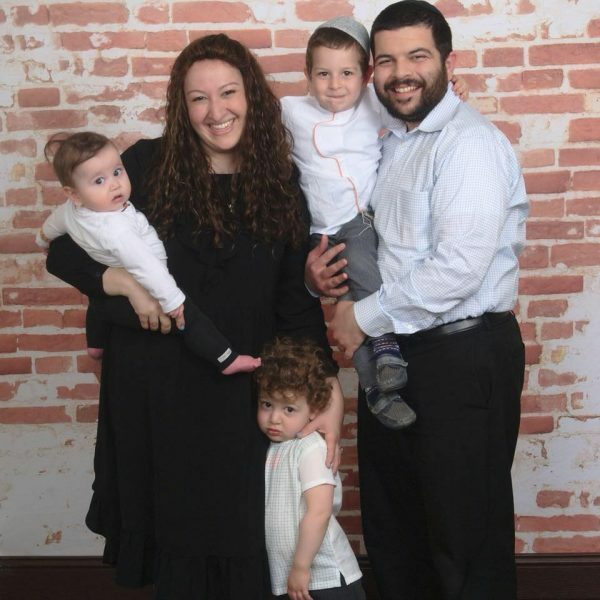 Her husband David, who is originally from here and a member of Frankel Jewish Academy’s third graduating class, left Detroit for a number of years, unsure if he would return someday. He attended college at MIT in Boston, moved to Chicago to start his career and then left to study in Israel at Shapells/Darche Noam for almost a year. When the two got engaged, David had just returned from Israel and accepted an amazing job opportunity based in Detroit. The couple house hunted for a while, and after not being able to find Erin’s $12 dream home (her New York understanding of Detroit real estate wasn’t totally accurate), they began their married life in an apartment in the heart of the Orthodox community in Oak Park. “I couldn’t believe that I moved out of my apartment in New York to move into another apartment here. But we paid for our whole apartment what I paid for a room in a three-bedroom in Washington Heights, so that was a win. It was a wonderful apartment in a wonderful complex, and we made great friends that we’ll hopefully have forever. It started us off on the right foot and it gave us time to choose the neighborhood that was right for us,” said Erin. Erin grew up in Silver Spring, Maryland, and couldn’t image that a community with as much warmth and inclusivity as her hometown existed. That was until she got a phone call from a stranger her first week in Detroit. “We got a call during our week of sheva brachos from a young women neither of us had ever met before. 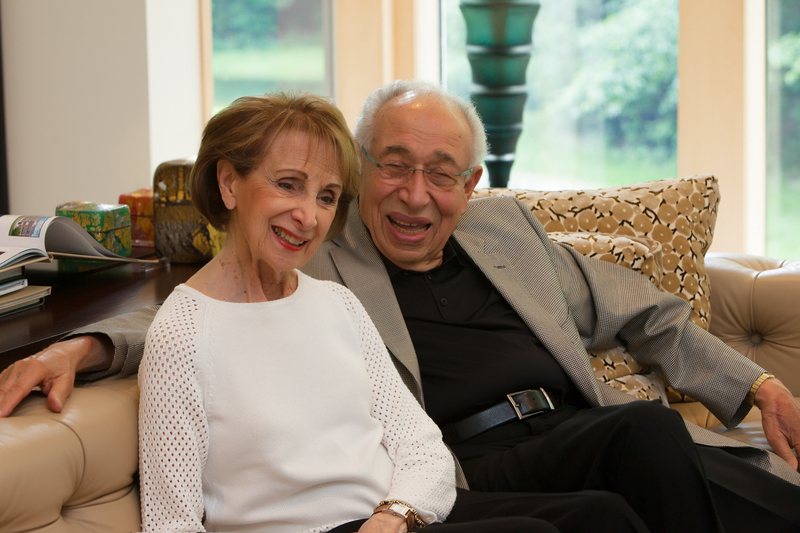 She said, ‘Hi, we heard you just moved to town, and we’d love to have you for Shabbos dinner.’ I said to David, ‘We got invited out, that’s so cool!’ We went, and she and her husband are still some of our favorite friends in town. But that was far from the last invitation. In their first year of marriage, Erin and David were invited out for every Shabbat meal — lunches and dinners. People in the community were so excited to welcome a new, young family to town that they were fighting over who got to host the Stiebels each week. 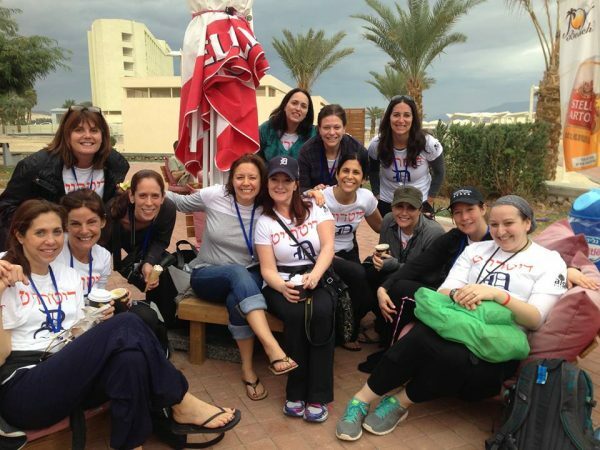 Staffing an Aish Detroit Moms Trip in Israel. Erin and David had no relatives when they first came to Detroit. Since then, David’s sister and her family have moved back to the area, but at the time the newlyweds were on their own. When they welcomed their first child, a baby boy, the generosity of the Detroit community once again overwhelmed them. Now the couple lives in a house in Southfield with their three boys, Alexander, 4.5-years-old, Solly, 2.5-years-old and Louie, 10-months-old. “I’ll be honest, I didn’t want to live here when we first got here. I didn’t know anybody here, and that was very hard. But in good old Erin fashion, I made sure to talk to anybody and everybody I could meet, and to get involved wherever I could,” said Erin. Yea, let’s talk about the Great BIG Challah Bake for a minute. If you were one of the hundreds of women who attended Aish’s Great BIG Challah Bake, Erin may look familiar. She played Master of Ceremonies for the event two years in a row at the Royal Oak Farmers Market. There’s a long-standing tradition of Partners’ staff members being on the NEXTGen Detroit Board. 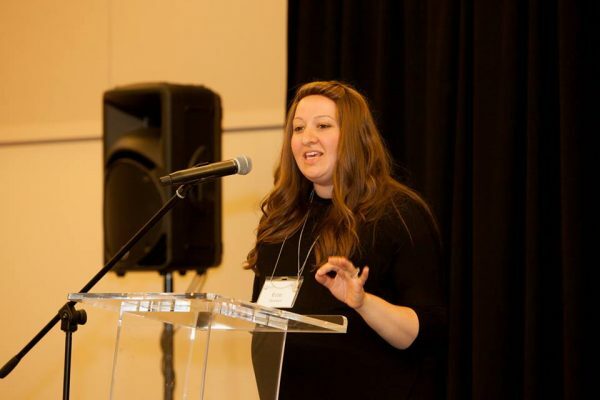 Rabbi Shragie Myers, a NEXTGen Detroit Board member for two years, was promoted to the Executive Director of Yeshiva Beth Yehudah two years ago. Because of his new position, his time became incredibly limited so he made the decision to roll off the Board when the year came to an end. It was the perfect time for Erin to take her newfound inspiration and apply it to a seat on the NEXTGen Detroit Board of Directors. Speaking at NEXTGen Detroit’s 2017 Annual Meeting as part of the PresenTense program. In Silver Spring, Erin grew up in spaces with Jews of all denominations. 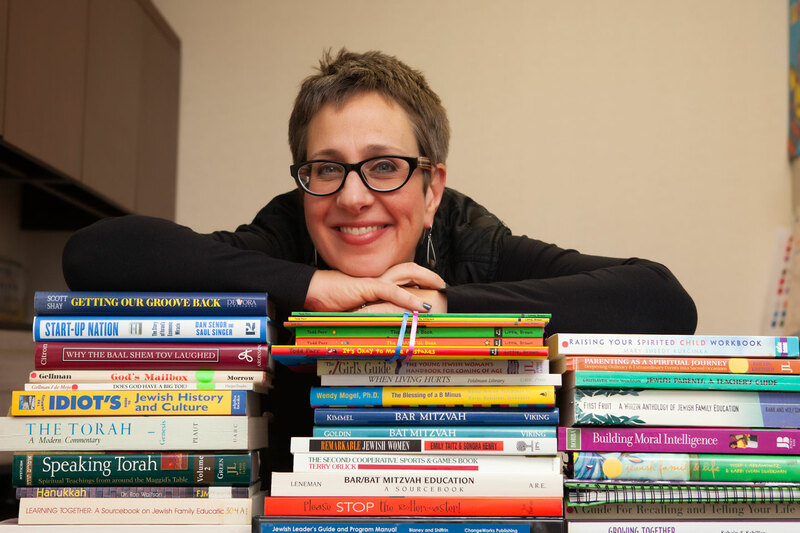 And as a Wexner Graduate Fellow, she loved the inclusive environment the program provided. So she was thrilled to find Jewish diversity though her work with the Federation and NEXTGen Detroit. 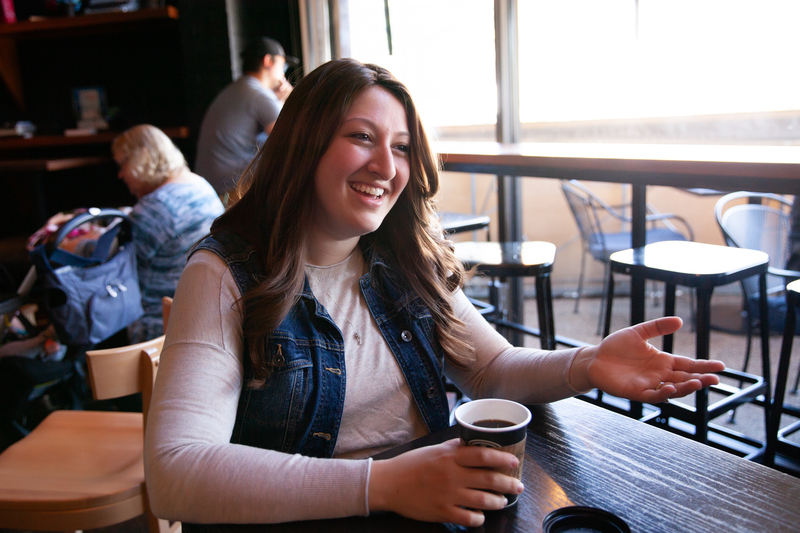 Since high school, Erin has been involved in NCSY, the youth group of the Orthodox Union. Her parents were involved in NCSY when they were growing up in Savannah, Georgia, and Charleston, South Carolina. And even though she grew up in an Orthodox community, her parents felt that the inspiration that NCSY could give Erin outside of her yeshiva day school education would be something valuable. 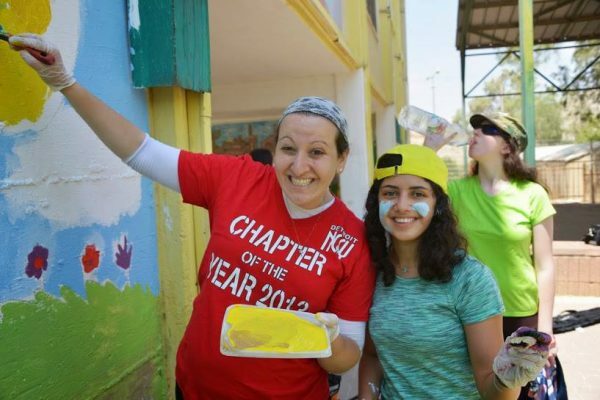 After high school graduation and a gap year in Israel, Erin started staffing NCSY programs. In 2009, she became the director of the NCSY program GIVE (Girls’ Israel Volunteer Experience), taking girls from all over the U.S. to Israel for six weeks to do volunteer work across the country. Erin is the Director of NCSY’s GIVE (Girls’ Israel Volunteer Experience), taking girls from all over the U.S. to Israel for six weeks to volunteer across the country. When Erin began, GIVE was sending 29 girls to Israel each summer. Now, the program has grown to almost 100 girls, from both Jewish day school and public school backgrounds. Now what do you do with all that “free” time? Free time? Hanging out with my kids is the best way I spend my ‘free time!’ Playgrounds and Paw Patrol are my jam these days. As an out-of-towner, though, I feel like most of my free time goes to maintaining relationships with friends and family that don’t live here through phone conversations and FaceTime. We FaceTime my mom every night during dinner with my kids. I also dabble in matchmaking. I’ve got four happily married couples under my belt. I feel like I’ve been blessed to get to know a lot of different people from a lot of different walks of life, and I try to connect them to each other when I can. I just recently got involved with a shidduch initiative here in Detroit. Favorite places to go around here? The kosher, drive-thru Dunkin Donuts. Come on, it’s kosher and drive-thru! It’s really dangerous actually, it’s where all of my hard-earned Jewish education money goes. We love going to the zoo, they have an awesome splash pad there. And it’s so close to where we live. We also love walking around downtown Detroit, especially the River Walk. And we love the Science Museum. We’re still exploring, but basically we follow Chef Cari’s food truck. Those hand-cut fries are just something special. I personally enjoy walking around Birmingham, it makes me feel really fancy. On the other end of the spectrum, I love Meijer. I can’t praise that store enough. It’s literally everything you could ever want. I could spend all day in there. David grew up here in the Bloomfield Hills area, and his grandmother was a sculptor. A lot of her statues are around Detroit. So, we go on adventures to find the sculptures with our kids and show them how her legacy lives on.